Bivariate spline approximation over a rectangular mesh on a sphere. Can be used for smoothing data. 1-D array of latitude coordinates in strictly ascending order. Coordinates must be given in radians and lie within the interval (0, pi). 1-D array of longitude coordinates in strictly ascending order. Coordinates must be given in radians, and must lie within (0, 2pi). 2-D array of data with shape (u.size, v.size). Positive smoothing factor defined for estimation condition (s=0 is for interpolation). Order of continuity at the poles u=0 (pole_continuity) and u=pi (pole_continuity). The order of continuity at the pole will be 1 or 0 when this is True or False, respectively. Defaults to False. Data values at the poles u=0 and u=pi. Either the whole parameter or each individual element can be None. Defaults to None. Data value exactness at the poles u=0 and u=pi. If True, the value is considered to be the right function value, and it will be fitted exactly. If False, the value will be considered to be a data value just like the other data values. Defaults to False. For the poles at u=0 and u=pi, specify whether or not the approximation has vanishing derivatives. Defaults to False. Currently, only the smoothing spline approximation (iopt = 0 and iopt = 1 in the FITPACK routine) is supported. The exact least-squares spline approximation is not implemented yet. When actually performing the interpolation, the requested v values must lie within the same length 2pi interval that the original v values were chosen from. >>> lats = np.linspace(10, 170, 9) * np.pi / 180. >>> lons = np.linspace(0, 350, 18) * np.pi / 180. 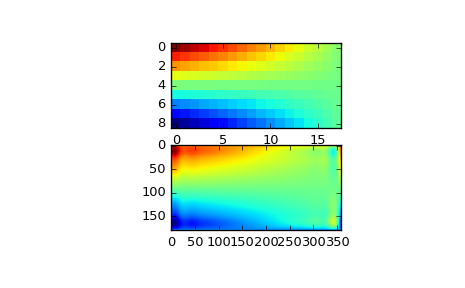 Finally we interpolate the data. The RectSphereBivariateSpline object only takes 1-D arrays as input, therefore we need to do some reshaping. Chosing the optimal value of s can be a delicate task. Recommended values for s depend on the accuracy of the data values. If the user has an idea of the statistical errors on the data, she can also find a proper estimate for s. By assuming that, if she specifies the right s, the interpolator will use a spline f(u,v) which exactly reproduces the function underlying the data, she can evaluate sum((r(i,j)-s(u(i),v(j)))**2) to find a good estimate for this s. For example, if she knows that the statistical errors on her r(i,j)-values are not greater than 0.1, she may expect that a good s should have a value not larger than u.size * v.size * (0.1)**2. If nothing is known about the statistical error in r(i,j), s must be determined by trial and error. 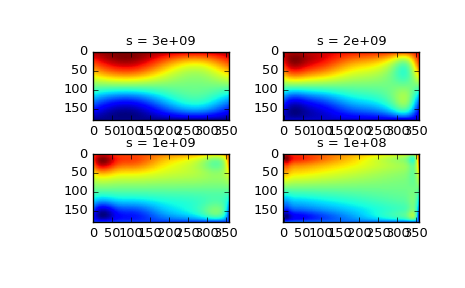 The best is then to start with a very large value of s (to determine the least-squares polynomial and the corresponding upper bound fp0 for s) and then to progressively decrease the value of s (say by a factor 10 in the beginning, i.e. s = fp0 / 10, fp0 / 100, ... and more carefully as the approximation shows more detail) to obtain closer fits.